Easy VoIP troubleshooting- MOS and bandwidth testing for VoIP quality. Typically, your true upload and download bandwidths should be at least 80% of your what your service provider's level of service states it is. Testing your bandwidth is easy and should be done at least occasionally, but if your VoIP quality drops then testing your bandwidth speeds should be one of your first tests. There are many sites available for testing bandwidth uploads and downloads. One of which would be DSL Reports. Knowing the bandwidths (upload & download) that you should be getting is important so you will be able to know how the actual measurements relate to those levels. They should be at least 80% using a valid test. A valid test should be one conducted without applications (including VoIP) running while the bandwidth test is in progress. Having tested your connection for packet loss, extreme jitter and bursts of packet loss from a ping test, and checked your bandwidth, a next test would be to do a more complete MOS style test. These tests measure a number of values that will affect VoIP and give a value which can be related to the expected voice quality of your connection. 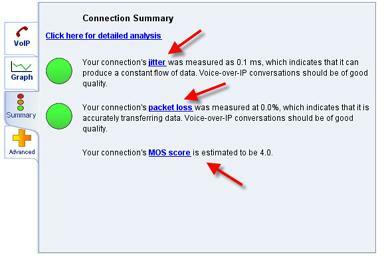 Run a test on your VoIP quality. Pick the codec that your connection uses. (If you are not aware of which codec you might be using check with your VoIP provider or pick G711.) After you complete the test, picking a server that is geographically close, you will be given some good information. 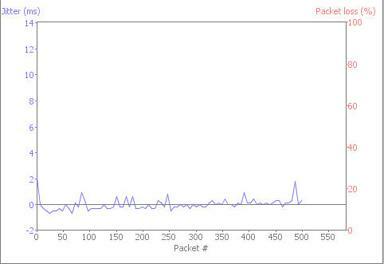 One factor that a VoIP test will measure is jitter, in which small variations will impact call quality. ATAs and IP phones are capable of handling very small variations in jitter by the use of buffering, but once the level exceeds what they can cope with begin quickly to degrade voice quality. For a description of voice quality and how it relates to a MOS score read this.